Yesterday I wrote about what ear infections are, what they’re not, and what causes them. Many parents don’t care so much about the what’s and why’s – they want treatment. Now. Because ear infections hurt, and no one wants to watch their baby suffer. Today I’ll discuss treatments. Regardless of the cause of the earache or what the ultimate fix will be, you will want to first manage pain. It does not matter if it’s a real infection or if it’s even the ears that are causing problems, if your child is in pain, treat the pain. Ear pain can be managed with pain relievers, whether it’s a true infection or simply pain from the congestion that comes with a cold. You can begin pain relief at home whether or not the ear infection is confirmed with standard doses of either acetaminophen or ibuprofen. Ear drops for pain work fast but the relief doesn’t last long, so I recommend also giving acetaminophen or ibuprofen per standard dosing recommendations in combination with drops. Ear drops can include both over the counter options and prescription options as long as the eardrum doesn’t have a hole or tube in it. Do not put anything in the ear if you suspect a hole or know your child has a tube unless your doctor recommends it. Olive oil works pretty well and most of us have that in our kitchen. Saturate a cotton ball with oil (not hot oil) and squeeze the cotton over the ear canal, putting 2-4 drops in the canal. There are many over the counter ear drops for pain, but I find that the oil you already own is not only cheaper, but works just as well. Prescription numbing drops are an option if your doctor thinks they are appropriate. These have been difficult to find in recent years for many factors. Be sure you’re using an approved product if you use prescription pain drops. If you’ve had an ear infection as an adult or watched your child refuse to sleep, you’ll know that ear infections can hurt more when lying down. Safely elevating the head can help the pain associated with the increased pressure lying down. For young infants, elevate the head of the bed by putting risers under the legs of the bed or by wedging something under the mattress. Be sure it is stable, whichever you do. Never put an infant under 1 year of age on a pillow or other soft bedding. For older children, propping up on several pillows is often helpful. Many toddlers and young children will not stay on pillows, so this is less effective. When kids have ear pain, they often have a runny nose, cough, fever, and other symptoms. Each of these should be managed as discussed on previous blogs: fever, green snot, cough, generally sick. How long symptoms will last are discussed here. Pain relief for anyone with an ear infection is the first treatment. See above. Monitor for the first 2-3 days without antibiotics in many instances, since most ear infections will self-resolve. Antibiotics can be used if symptoms persist more than 2-3 days ~ earlier for children under 6 months of age, those with significant illness, those who had another ear infection within the past 30 days, or for those who have an increased risk of ear infection (such as immune deficiency or an atypical facial structure or chromosomal defect known to affect hearing or immune function). If a child has tubes and develops an ear infection, pus will drain out of the tube. Antibiotic ear drops are the first choice for this type of infection. Antibiotics by mouth are not typically needed. Prevent the next ear infection. See Part 3 tomorrow! Why not use antibiotics for every ear infection? The large majority of ear infections are caused by a virus, for which antibiotics are ineffective. About 80% of ear infections self resolve without antibiotics. Not only are antibiotics not needed, but they also carry risks. About 15% of kids who take antibiotics develop diarrhea or vomiting. Nearly 5% of children have an allergic reaction to antibiotics — this can be life threatening. So when you look at the benefits vs risks, you can see that most of the time antibiotics should not be used as a first treatment. When bacteria are exposed to an antibiotic but don’t get completely killed, they learn to avoid not being killed the next time they see that same antibiotic. This is called bacterial resistance, also known as “superbugs”. Superbugs can be shared from one child to another, which explains why some children who have never had antibiotics before have an infection that is not easily taken care of with the first (or second) round of antibiotics and why if a child needed several different antibiotics to clear an ear infection might get better with generic amoxicillin with the next. It’s the bacteria in the ear that become resistant, not the child. The more we use antibiotics, the more resistance builds up and the less likely antibiotics will work for serious infections. What are tubes and how do they work? 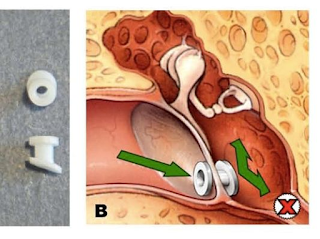 Tympanostomy tubes are small plastic tubes that are placed in a surgically made hole in the eardrum (tympanic membrane). They keep the hole in the eardrum open so that if pus develops in the middle ear it can drain out through the tube. This helps prevent the pain caused by the pus filling the middle ear area and pushing out on the eardrum. It also helps prevent the hearing loss that happens when the eardrum can’t move due to pus behind it. Pus behind the eardrum causes many symptoms, which may include balance problems, poor school performance, hearing difficulties, behavioral problems, ear discomfort, sleep disturbance, and/or decreased appetite with poor weight gain. The benefits of tube placement for these children must be compared to the cost and risks of anesthesia and having an opening in the eardrum. The majority of ear infections resolve completely without complication. The longer the pus remains behind the eardrum the less likely it will go away. If the pus is there longer than 3 months, it’s less likely to resolve without treatment. Since placing tubes does involve risks, they are not recommended for everyone. If pus or fluid has been in the middle ear for over 3 months (OME or OM that never clears), a hearing test should be done. If the hearing test is failed, tubes should be considered. Children with higher risk of speech issues or hearing loss may be considered for tubes earlier. This would include children with abnormal facial structures, such as cleft palate, or certain genetic conditions that predispose to developmental delays, hearing concerns, or immune problems. Dr. Deborah Burton is an Ear, Nose, and Throat (ENT) surgeon who answers common ear tube questions and discusses common tube complications in just a couple of her fantastic collection of blogs. She also gives tips on how to avoid ear infections to prevent the need for surgery! What about recurrent ear infections? I know parents get frustrated with recurrent ear infections, and I’ve seen many families who are happy that they got tubes for their child after recurrent ear infections, but studies show they aren’t really necessary. If each ear infection clears, that shows that the eustachian tube (the tube that drains the middle ear into the throat) can do its job. As long as the pus is there less than 3 months with each infection, the risk of tubes does not usually outweigh the benefits according to studies. Again, quality of life can factor in here and I think that’s hard to measure in a study. If kids are missing out on sleep and not eating well due to ear pain, tubes might really help. Discuss this with your child’s doctor. Are there kids who should be considered tube candidates earlier? Some kids are more sensitive to the problems associated with OME. These kids might have sensory, physical, cognitive, or behavioral issues that increase his or her risk of speech, language, or learning problems from pus in the middle ear. Children with known craniofacial abnormalities or chromosomal abnormalities who are at higher risk for speech and hearing impairment will also be considered for tubes more liberally. These kids might benefit from tubes even if they don’t have pus for 3 months in the middle ear or hearing loss. What are complications and risks of tubes? Tube placement requires anesthesia, which is overall safe, but not without risk. Tubes keep a hole in the eardrum, which can allow water and bacteria to get into the middle ear, leading to infection. This leads to pus draining out of the ear canal, called otorrhea. This pus can be treated with antibiotic ear drops initially, and oral antibiotics if it last more than a month. Some ENTs recommend earplugs when kids with tubes swim, but studies do not show that they are needed in most cases. If kids get recurrent otorrhea, they might be candidates for earplugs when swimming. Kids who swim in lake water or do deep water diving might also benefit from earplugs. So now that you know what ear infections are and how to treat them, check in tomorrow for Part 3: how to prevent them. Fantastic and helpful overview of treatment of ear pain. Love the suggestions including olive oil!